Rob is back again today following up the most recent post on stage lighting. Thanks Rob for this great series! The main component of lighting for dance, side light profiles and models the body and shows off the stature of a human subject. This, along with it’s ability to colour only one side of an object, while leaving the other side to be coloured differently, make side light attractive when lighting the human form at it’s most dramatic. More on Side Light. An example of Side Light.Side light can come from high above, down low on the deck or a similar height to the target the target - where it is often called cross light. This provides us with a great way to light a person on stage with natural colours, while standing out a deeply coloured stage floor (from the back light) which remains untouched by the sidelight. All light sources arriving from deck level can be called footlights, the common practice in the theatres of history to place wicks burning in oil along the stage front gave rise to the term “floats” that we still use today. Foot Light.Light coming from below is the natural angle of a campfire, but is unnatural in many everyday situations, making floats quite spooky and ethereal as the natural shadows of our faces seem to be upside down. Subtle low angle lighting can be a great way to create intimacy on stage and can look really nice on the faces of choirs - a common effect if they are carrying candles. The other great use for foot lights is the creation of shadows at the rear of stage. Depending on the angle used, shadows can be tall and looming or more subtle and appear to create more on stage than actually - mirroring a choir by adding a few more rows of figures for example. Try it out with a few carefully placed PAR16s next weekend....! More on Foot Light. Now most of the time, you won’t want the drama of using one single lighting angle exclusively in your stage picture but instead blend them together and create a different balance between elements. Mixing the differing angles and their properties can create one look, while a subtle change can make the stage transform before your eye - all before you have even considered light colour. I have always liked to group my different angles together on different submasters, look at the stage and balance the picture in the same way that a sound engineer balances a mix of audio sources. They use their ears, in lighting we use our eyes. If your church is low on resources, you probably won’t be cover all bases but I would encourage you to look beyond simple front light and visibility, to find a way to add some additional modelling light from further upstage in any form; high side, back or top light. The difference it makes to your overall stage look is really something. Oh, and maybe you can get really creative with some complimentary shadows. Stay in touch and come and visit us over at On Stage Lighting. 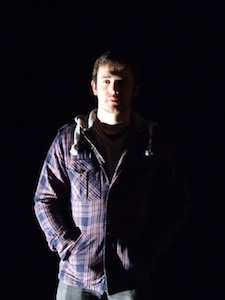 Rob Sayer is a professional educator, Lighting Designer and programmer who is currently lecturing in Theatre Production at Bath Spa University in the UK. With 20 years professional experience in show business Rob is also the Editor of On Stage Lighting, the world’s most popular blog on learning production lighting techniques. 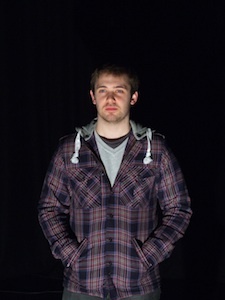 With thanks to Alex Musgrave, lighting designer and student at BSU who appears in the examples.